The Lockheed Martin Career Development Center will host a Prepare For The Job Fair event to help you prepare for the All Majors Job Fair. During the event, you will learn how to communicate your purpose, highlight strengths, and make a strong first impression. The event promises to provide tips, advice, and answer questions that will help you prepare to talk with employer representatives. The All Majors Job Fair is an excellent way to meet dozens of employers in one place, allowing them to efficiently meet potential employees. Being prepared will ensure you have a positive experience at the All Majors Job Fair! Enhance your understanding of a job fair and its purpose. Become aware of how to research employers and best prepare to attend the All Majors Job Fair. Successfully create and deliver an introduction of yourself. 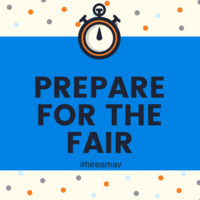 Learn how to effectively navigate the All Majors Job Fair. Enhance your networking skills. Recognize the importance of following up with employers.